I have always believed that life with horses brings so sharply into focus the “Circle of Life” as so beautifully composed by Elton John. Life with horses is a “wheel of fortune,” “leap of faith,” and “band of hope.” Life with horses is about beginnings and endings, about extreme highs and sinking lows. This past month at Shepherd Farm has been the most intense month of our decade-long operation. This month brought the birth of three beautiful healthy fillies, bookended by the tragic and untimely loss of two magnificent mares. This past week began with the birth of a stunning leggy Hanoverian filly. The excitement, joy and adrenaline rush of seeing that little head in a white sac poking out of the back of our mare cannot be described but only experienced. By contrast, a mere 48 hours later, we stood in the dark of night under a tree with our beautiful Percheron mare. We stood there after spending the day trying to save her life by dislodging her displacement. Exhausted and sorrowful, we made the decision to end her life. We felt a sinking low – the kind that overtakes you completely and ends in tears and a sense of blankness. Early May is when the barn swallows return to the barn. The mother birds swoop in and out of the barn aisle busily building their nests in the beams in the barn ceiling and in the barn loft by the sliding doors. This past Saturday was a gorgeous spring morning. The morning sun was blanketing the barn and the surrounding trees and flowers. We decided that it was a good morning to take some farm pictures so we closed the upper barn doors in the loft and took several nice photos. Later that Saturday, we had a few families at the barn for Youth Ranch activites. As we were riding Peggy in the round pen behind the barn, one of the children said that he heard birds chirping on the ground behind the barn. That certainly seemed odd so we all hushed and listened. We could hear faint, high-pitched sounds coming from the ground behind the barn. I reached down to the area where the sounds were coming from. After digging through some straw that had fallen to the ground, I saw seven tiny birds with their beaks open and necks stretched, calling for their mother. The birds were the size of my thumb and were covered in fuzz. Apparently, their nest had fallen from the barn loft when we closed the loft doors to take pictures earlier that morning. When the baby birds fell from the barn loft at least 30 feet up, their fall was broken by a glorious hanging geranium plant that we had purchased the week before to celebrate the life of our foundation mare Treveri. The birds lay just to the right of the hanging plant. The plant was covered in straw from the fallen nest. We took the baby birds immediately to Second Chance Wildlife Center where we were assured that all seven little barn swallows were healthy and would survive to be returned to nature in a few weeks. Awesome! At some time during the pre-dawn hours of Saturday, April 24th, the horse who was the heart and soul of our farm and our breeding program quietly left this world and passed forever out of our lives. We came down to the barn early Saturday morning to find our beloved Treveri (“Trevi”) laying on her side – motionless in her stall. Thankfully, it appeared that she did not struggle before passing, as she lay in a soft bed of shavings that were undisturbed. Remarkably, the day before Trevi passed, we decided to leave work early on a beautiful spring Friday to spend some extra time in the barn before nightfall. This Friday, we decided to give Trevi some extra attention and her second shedding session of the season. It had been a few weeks since her spring mane pull and shed out, and she looked like she needed more grooming time. I made a mental note that this year, Trevi did not shed out as well as she had in past years. Trevi enjoyed grooming – to a point. If you curried her in her special spot right below her withers and did not require her to step too far from her hay pile, you could get away with grooming sweet Trevi for a good long time. She would let you know that she was enjoying her grooming session by taking a break from her hay pile to nuzzle you energetically with her pursed lips and to lick your hand over and over. As we brushed Trevi that Friday, I grew concerned. Trevi seemed thinner than she had just a few short weeks ago. She seemed more angled up in the flank and her ribs were beginning to show. I stepped back a bit and just watched Trevi move around her stall. It struck me after watching her for a few moments that she was a bit off. She had eaten all her grain and her hay, but she was off. The only way that I can describe it is to say that she was “imperceptably diminished.” She moved slower, was less robust, less vivid, less colorful. She did not whinney in her bold deep voice, but quietly, yet earnestly ate from her hay pile. I rubbed her head and curried her withers. I brushed her beautiful tail and wavy mane. I hugged her huge neck and kissed her over her eye. I was distracted with concern. I then decided that she needed an apple. So I left the barn, walked up the hill to the house, cut her an apple and brought it down to her. I had not fed Trevi an apple since Christmas. I left the barn later that night and decided to check on Trevi very early the next morning before I left for my race. I never made it to the race that next morning because when I checked on Trevi, she was already gone. I remarked on how amazing it was that we shared that last beautiful spring night with her – where she was the center of our attention. Remarkable. 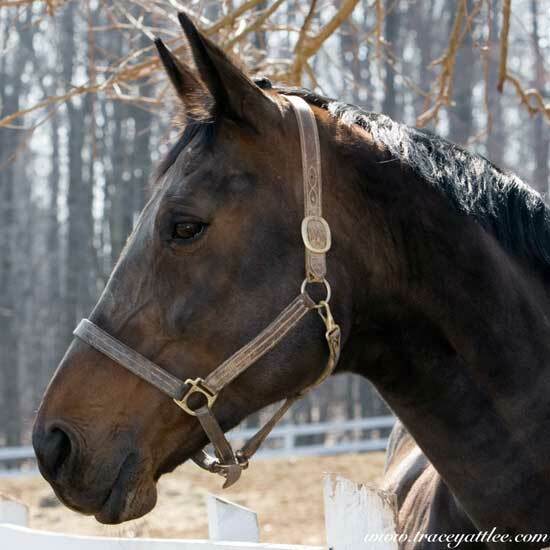 Trevi came to us in March of 2002 as our foundation Hanoverian mare. She was fifteen years old. At that time, she was in foal with Dartmouth. Trevi has given us four beautiful fillies who are our next generation of broodmares. Trevi stamped each of these fillies with her three magnificent traits: a loving maternal instinct; a strong desire to bond with her human companions; and the unflappable character and indomitable spirit of a true herd leader. Trevi was a loving and nurturing mare. 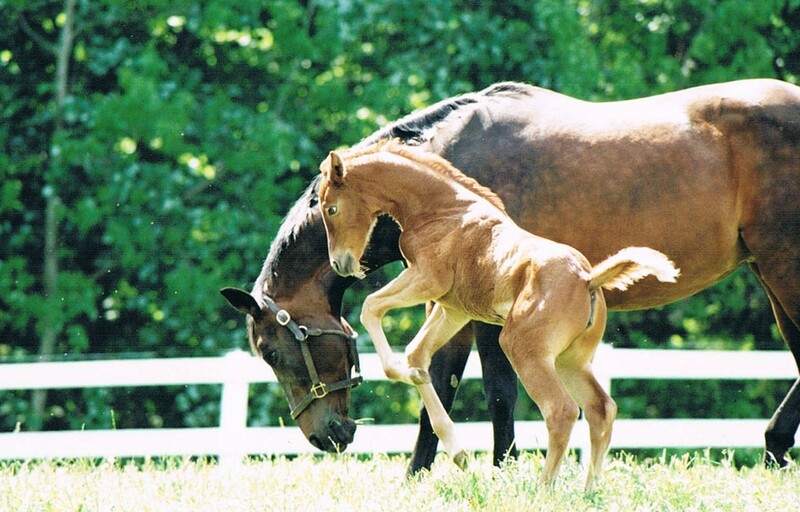 From the moment that her foals were born, her intense bond with her foals was evident. She nickered to her newborns in her deep passionate voice, smothering the baby foals with kisses. She cradled her foals under her neck, encouraging them to nurse with a gentle nuzzle. She stood tirelessly over her foals for the first 5 days of their lives, rarely even taking time to drink or eat, not wanting to leave their side in those vulnerable first days. Trevi’s bond with her offspring continued throughout their lives. One of the most beautiful bonds that Trevi had was with her daughter Farethewel. Trevi and Farethewel were turned out together each day. Trevi was in charge in a kind, calm assertive way. Trevi and Farethewel grazed side by side, parallel, like a reflection. Trevi would always come to the gate first for dinner, pushing ahead to assert her seniority. The funny thing is that if Farethewel took too long to get to the barn, then Trevi would grumble and nicker, showing that she already missed her companion even after just leaving Farethewel in the pasture to rush in for dinner. Trevi and Farethewel shared a stall wall with boards that left just enough space between the boards for Trevi and Farethewel to stretch their lips and nuzzle eachother through the boards. They did this often. 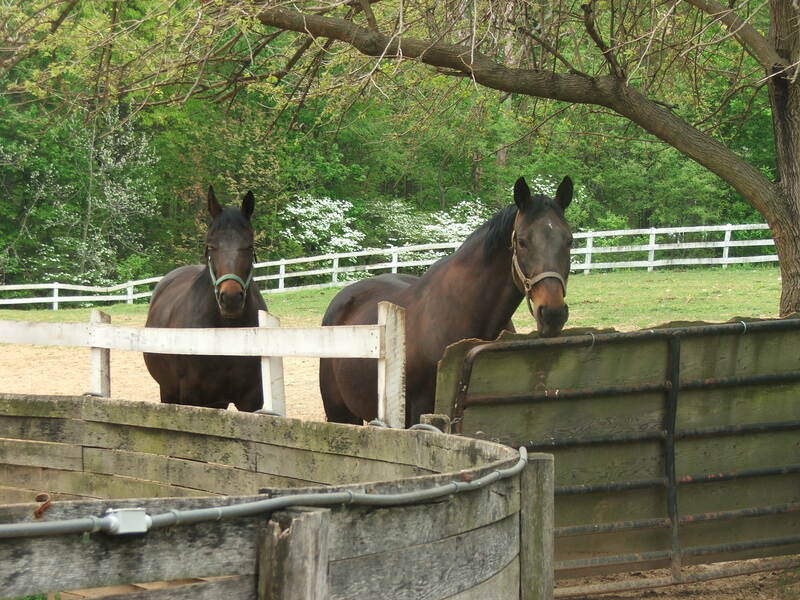 At night, the two friends would press up against their shared stall wall and rest standing next to eachother. At other times, they would rest by the stall wall in their relaxed sternum positions. Farethewel misses Trevi tremendously now – day and night. Trevi was unflappable and a true herd leader. She was always dignified and calm. In all the years that Trevi was with us, and through all her foalings and the challenges of old age, Trevi never showed fear or insecurity. She was calm and strong. She was not upset by lightening, wind or rain. She accepted blankets, leg wraps, shots, baths, and wormers. She loaded on a dime. Trevi never met another horse that she could not handle and never saw a meal that she could not finish off. Up to her very last day, Trevi was a herd leader, a gentle affectionate mare, and a devoted companion. We were privileged to spend so many years with such a special horse and grateful for the many daughters that she has given us and through whom her beauty, spirit and essence will continue to grace our lives. We love and miss you Trevi. A few nights ago, I witnessed something beautiful on the farm. It was just before midnight on a cool spring evening and I walked out to the far pasture to check on Winne, our young mustang gelding. Winne had been colicky earlier that day and we had called the vet out to check on him. The vet gave Winne some banamine and tubed him. Winne seemed better after the vet visit, but he was still uncomfortable so I thought it was best to check on him one last time before bed. Winne shares a pasture with Katie, our 15 year old Oldenburg broodmare. Of the two pasturemates, Winne is clearly in charge. He comes to the gate first to be brought in for feeding, chooses the best hay pile to eat from, and herds Katie around, walking behind her and using his nose to guide her in the direction of his choosing. When we put out the special alfalfa hay, Winne makes sure to select the biggest pile for himself. 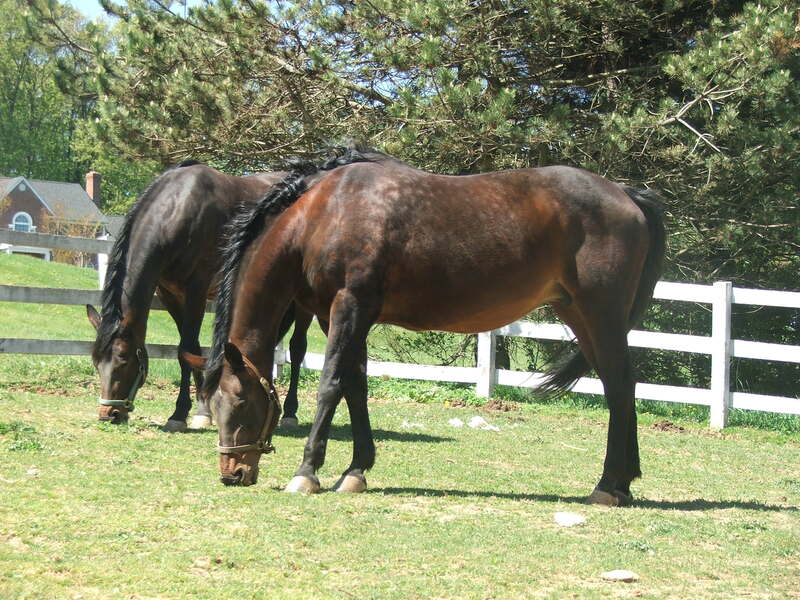 Katie is a gentle sweet mare and she obliges his behavior and accepts his leadership. When I arrived in the far pasture that night, I looked nervously to see if there were “two horses up.” Whenever I am worried about a horse it is always reassuring to see that the horse is at least standing up. This time, my heart sank a bit as I only saw Katie and not Winne. I hurried over to the pasture to find Winne. When I finally got close enough to see — what I saw was amazing. Katie was standing, with her back to the wind, over Winne, who was nestled in the sternum position between her two front legs. Katie touched Winne every so often on the top of his head with her muzzle and craddled him with her front legs, neck and head. The roles were reversed and Katie was protecting Winne. I had seen Katie similarly cradle and protect her foals many times over the years. Winne was relaxed and content to be with his friend who was assuring his safety. It is later in the week now and Winne is feeling much better. I know this because he is once again first to the gate and first to that special alfalfa pile. Katie has stepped back to accomodate her friend, but I know she will be ready to step up in the future when her protective instincts are awakened and needed once more. This past Friday, my first cat Darrow went to the Rainbow Bridge. She was actually my first “pet.” I adopted Darrow from the DC Animal Shelter 15 years ago. It seems like a lifetime ago now – but I adopted Darrow when I lived in a studio apartment in Washington, DC and spent my days and nights working in a law firm. So enamored with the practice of law at that time that I named Darrow after Clarence Darrow – a famous trial lawyer. Darrow was a beautiful black tuxedo american shorthair cat. She was gentle and sweet and had the biggest softest green eyes you could ever imagine. I adopted Darrow when she was only 6 months old. She was small and energetic and would race around my small apartment, jumping from table to day bed, to bookcase in a single bound. When she was finished with her aerial lap around the studio, she would sit in the sun on the windowsill and groom herself – her shiny black fur healthy and full. The Saturday afternoon that I left the Shelter with Darrow, I left with a handful of pamphlets about diseases that could threaten my cat – most of them she had been vaccinated against before we left – but there was one that scared me “upper respiratory infection.” That one sounded pretty sinister. A cat could be fine one day and then the next be wheezing and sick and soon after perish. How awful I thought. Darrow had been home a couple of days in the apartment and she was so quiet. She was eating and was reasonably affectionate – but quite reserved. By the third day – she started to make a sound I had not heard before. It sounded like a deep wheeze. I was concerned. I listened, looked, prodded. When I picked her up and held her – she wheezed a bit more. Horrors I thought. It was late at night and the vets were closed. I went back to that adoption folder and reread that pamphlet on upper respiratory infection. I was convinced – Darrow was sick. So there you have it – Darrow was the beginning of a long line of beautiful relationships that I have come to have with many other cats, dogs, and horses. Fortunately for all those who have since been in my care, Darrow was also the beginning of a long journey of learning. I miss you sweet Darrow and thank you for all that you were. Have you ever noticed how good (most) horses are at having their cheese moved? We had a mare who had been on our farm for 6 years. She had her same pasturemates and stall buddy, and she ate her hay and grain at about the same time every day. She sunned herself on the same hill, groomed her friends, and nuzzled the cat about the same way every day. Then one day, we decided that this lovely mare needed a job and that she would go to a trainer to be put under saddle for dressage. So we took our mare off the farm that she had known her entire life and brought her to training. Her whole world changed in an instant. At the end of the short trailer ride, our mare found herself in a large training barn with many other horses. She had different pasturemates, a different stall buddy, different food, and an entirely different schedule. She was no longer lazing in the sun and grooming her yearling friend, but rather was learning to lunge with leg wraps and to accept a saddle and a rider. For our sweet mare, someone had clearly moved her cheese. But, in a matter of days, she adapted beautifully. She embraced the change. She appeared to love her new job and the added attention that came with her new life. I thought about my mare the other day when I got a new and very challenging case assignment at work that will require that I learn a new sector of an industry and travel more than I have been. Change. Not complete change — just some change. Hopefully, I will embrace the change with the same determination and grace that my mare showed. I also thought about how often we, as “owners,” change an animal’s circumstances completely – we adopt out a dog to a new home, move a horse to a new boarding facility, take on a new barn cat. For all these creatures, they are experiencing complete change. And without exception, they all show themsleves to be good students of Spencer Johnson. We spend a good part of our day in the company of dogs and horses. We like to think of ourselves as good pack/herd leaders, setting boundaries, being calm assertive, rewarding good behavior and correcting bad behavior. So when a dog jumps all over us when we are serving up the kibble, we make him sit and stay before getting his meal so he learns that jumping is not rewarded and calm sitting before meals is rewarded. When a horse kicks wildly at the stall door at feeding time, we make her wait. Kicking the stall door is a behavior that we would like to extinguish. And then there is Dapple – to whom a separate set of rules apply. Dapple is our BLM rescue burro. She has a good set of lungs. Dapple is in a paddock at night that faces our bedroom window. She watches the window very carefully on dark winter mornings. She sees when we wake up and turn on the bedroom light. She is adamant that her hay and grain arrive in her paddock approximately 5 minutes after the bedroom light goes on. She indulges us 5 minutes, then lets loose a mighty bray. Here, follow this link and you will get to hear what our neighbors hear at 5:30 a.m. instead of their morning alarms. Suffice it to say that Dapple has trained us to beat it down to the barn and get her hay and grain pronto. It is either that or stumble around in the dark after we wake up so that Dapple does not know that we are up yet. Now that I will not do – we all have our limits!